Ta Fantastika Theatre in Prague presents an entertaining black light theatre adaptation of Alice in Wonderland. Aspects of Alice is only loosely based on the classic Lewis Carroll tale. The rest is for your mind to decide, as you are submerged into a world of illusory creations and hidden secrets. The show is also set in Old Prague, to where we journey back in time to witness important events in the city's history. Black light theatre is a typically Czech art form. 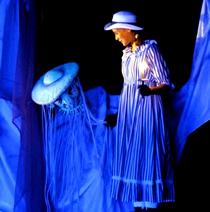 The show is a combination of mime artists, large screen animated film, colourful lighting, rousing music and unique black light theatre tricks. Backed by some excellent artistic design, the result is a fine theatrical experience. A central theme of black light theatre is objects moving around the stage, mid-air, seemingly with no visible means of doing so. Clever lighting enhances the effect, to the extent that these strangely moving objects play as important a role in the unfolding drama as the actors. The performance concludes with a 15 minute workshop which reveals some of the secrets behind black light theatre tricks. Among other things, a member of the audience can learn how to fly! Ta Fantastika Theatre is very centrally located, just three minutes walk from the Old Town Square and one minute from Charles Bridge.